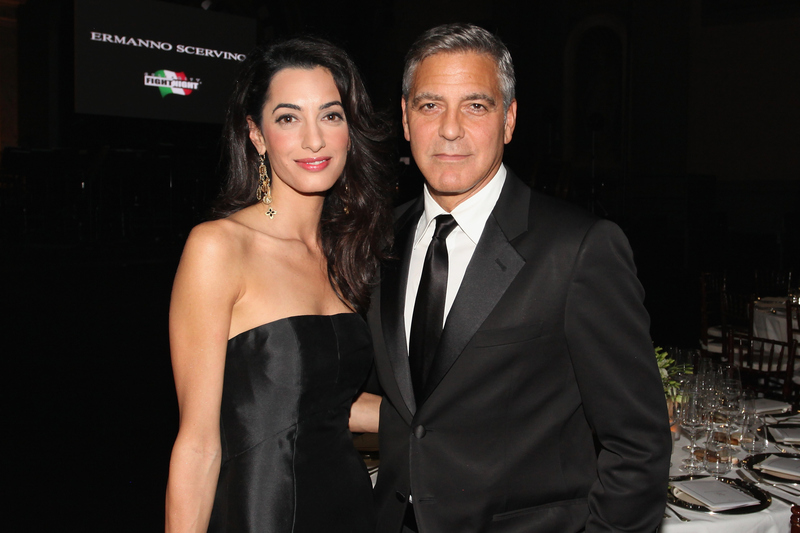 If you're still depressed by all of the recent celebrity breakups (like that of Amber Rose and Wiz Khalifa, or Jordin Sparks and Jason Derulo) good news — we've got some happy celebrity couple updates to turn your tears of sadness into legitimate tears of joy: We're now down to mere hours and minutes before George Clooney and Amal Alamuddin's huge wedding goes down in Italy. As everyone likely knows by now, back in April, Clooney finally decided to hand in his "playa" card (again) in exchange for a happy wife, and an even happier life. I'm not ashamed to count myself as one of the people who have no clue why they're so captivated by Clooney's wedding...mostly because I've been too preoccupied with reading all about what happened at Clooney and Alamuddin's bachelor and bachelorette parties. Worth it. Ahead of what will surely be a lavish, star-studded affair on Monday, Clooney and his bride-to-be appeared to take things easy during their respective outings. Instead of going crazy on a party bus or skinny-dipping in a Venice canal, the couple were joined by family and friends and took separate boats to dinner. Judging by the photos, the night offered several of those "wish you were there" moments, but unless you're important enough to have landed on the Clooney-Alamuddin guest list, you'll have to settle for looking at these photos of the couple enjoying themselves before they say "I do. "Here's Clooney and his boys sipping on some tequila. Since he reportedly flew in over 100 cases of tequila, it's safe to say there was plenty to go around. Here's Alamuddin leaving for her bachelorette party and looking like the luckiest bride in the world. And Clooney's laughing it up with the guys. No sign of cold feet here!